While poking through my refashion pile, I found a cut up Henley shirt my husband once wore. The body of the shirt was removed for a previous refashion that I can’t remember. Again, I found inspiration on Pinterest and studied several color block shirts using solid colors and stripes. Hmmmmm. Would an old dark blue polo shirt work with a Henley shirt? I think so. I snipped off the body of the polo shirt and attached it to the remaining portion of the Henley shirt. So far so good. To complete the refashion, I slimmed down the long sleeves and shortened them to fit. I removed the sleeves from the polo, cut them to size, and added them to the long sleeves. Beautiful! 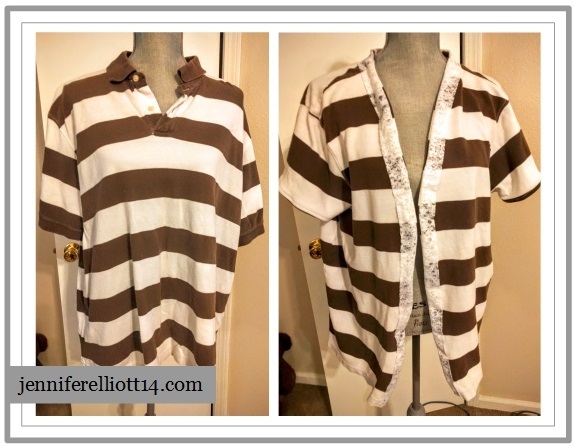 I am so in love with this refashioned shirt. I love it! With a second old polo shirt from my husband, I turned it into a simple cardigan. I removed the collar and button placket; made a cut down the center of the shirt; took off the stretchy band thingy around the sleeves; slimmed down the sleeves; created a new rolled hem on the sleeves; created lace strip from my stash; and sewed it around the front opening. I’ll probably add a closure to the front when I have a chance to forage through my button box. The lace adds a touch of femininity and cleans up the look a little. A nice simple button or closure will complete the look. 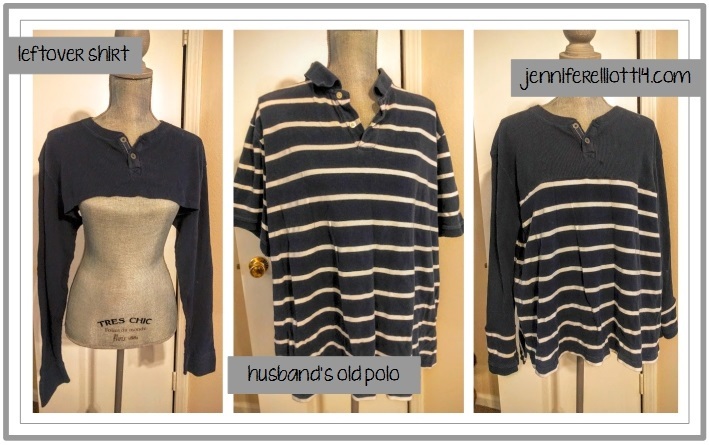 With a ton more polo shirts in my refashion piles, I need to browse Pinterest for more inspiration and ideas. Oh my goodness! I love the dark blue stripey shirt! Great use of the henley and the polo. I really must try this! I just bought a shirt like your first refashion! The blue striped shirt! I spent $20 on my solid color pink on top and pink and white striped on bottom shirt. I can’t believe you made that! So awesome.